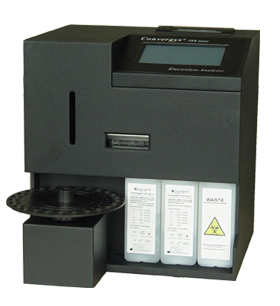 The Analyzer is designed, developed and manufactured in Germany. It has a very compact design and the only interface is an extremely user friendly LCD touch panel with a logically assigned menu structure. The Analyzer is equipped with a fully automatic sample aspiration probe. The samples are aspirated from sample cups which are stored in a sample rotor with 25 sample positions located underneath the sample aspiration probe. Position 0 is used for calibration, emergency samples, rinsing and sensor testing. The Analyzer can store up to 500 tests and 31 tests for each of the 2 QC levels. The Analyzer has a separate QC database option for automatic calculation of calibration factors of each ion.